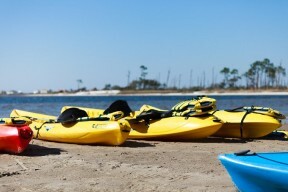 At the heart of the island, Gulf State Park has more than 6,000 protected acres and a host of amenities: serving as the perfect hub for biking activities. The Hugh Branyon Backcountry Trail, designated as a National Recreational Trail, includes more than 25 miles of pathways through the park and beyond, from Orange Beach to Gulf Shores. From the lowland marshy alligator habitat to the piney woods where majestic Bald Eagles nest, you can explore diverse island areas off the beaten path when you travel by bike. There are the wetlands of Rosemary Dunes and Cotton Bayou, the boardwalks of Lake Crossing and Beach Mouse Bypass and the oak canopies of Gulf Oak Ridge. These trails and more offer a total of 28 miles to explore. Many choose to stop and enjoy a leisurely break at Lake Shelby’s picnic area, the Butterfly Garden on Catman Trail or one of several newly constructed observation areas. Trails also provide access to the park’s interpretive and nature centers, beach pavilion, fishing pier and new lodge and conference center. Are You Riding, Or Are You Hiding? Both serious cyclists and those out for a day of sightseeing find the bicycle and multi-use paths in Gulf Shores and Orange Beach to be a welcome addition to their time at the beach. 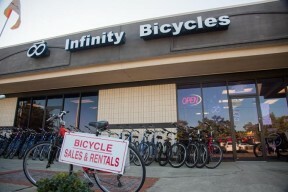 For those who don’t choose to bring their own, there are plenty bike rentals available on the island. From road bikes to comfortable trail riders, you’ll find the right option for your crew. There are even beach bikes, cruisers, kids bikes, and pull-behind trailers for rent, too. Rental companies are eager to meet any special needs if you give them a call in advance. Trail maps can also be found at most bicycle rental shops as well as at the Gulf Shores and Orange Beach Welcome Centers. Beyond Gulf State Park, roadside trails offer more opportunities for exploring the island. 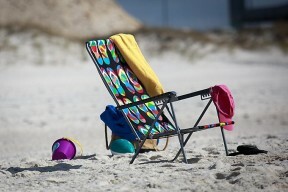 In Gulf Shores you’ll find a multi-use path westward along Fort Morgan Road (Highway 180) for more than five miles. Sidewalks and bike lanes line both neighborhood streets and Gulf Shores Parkway (Highway 59). Beach Boulevard (which extends from Gulf Shores and through the park and into Orange Beach) is lined with bike lanes, taking riders among the white sand views of the beachfront as well as offering convenient access to accommodations, restaurants, and retail stores. Isn’t it time to get out and enjoy the ride? Everyone has their favorite outdoor activity during a trip to Gulf Shores and Orange Beach, but biking has become the number one choice for many. It’s no wonder! With the many rental options, easy access, miles of trails, and variety of landscapes to explore, who can resist? If you want to go beyond the beach, the bike trails on Alabama’s Gulf Coast offer the perfect addition to your itinerary. Make your plans now to hit the trails! 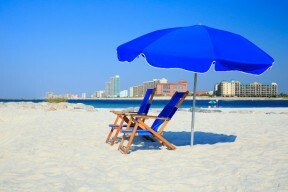 Don't forget to also book your Gulf Shores or Orange Beach condo, hotel, house rental, or other lodging option as well!